Wood flooring is an excellent choice for any homeowner. It is a natural, renewable material that is hard wearing, versatile, easy to look after and adds character and style to any space. Wood flooring is planks or blocks of flooring that have been made from hardwood species such as Oak, Walnut, Maple or Hickory. The hardwood has been cut from the tree and then made into either solid wood flooring or engineered wood flooring. 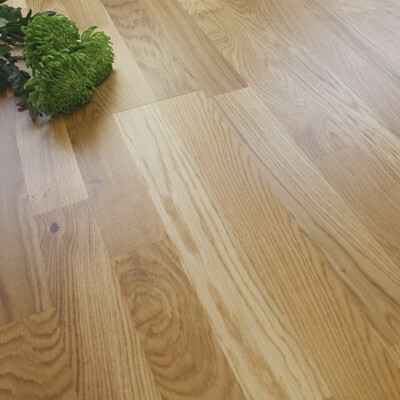 Solid wood flooring means that the whole plank of flooring is made from just one solid piece of hardwood. The wood is cut, machined and sanded into planks of flooring. Engineered wood flooring means that the top layer of the plank of flooring is made from real wood and the base layers are made from other types of timber to give additional strength and stability to the flooring. To find out more have a look at the following article: What is the difference between solid wood and engineered wood flooring? What are the different wood flooring species? Wood flooring is available in a wide variety of different species of hardwood. The most popular being Oak. The species of wood is very significant as it determines some important characteristics of the flooring, such as colour, grain pattern and durability. The colour and pattern of wood flooring can differ a great deal depending upon the species. For example, Maple wood flooring will tend to have light and pale tones with a smooth grain pattern, whereas Blacknut wood flooring is mostly dark brown but has swirling golden tones running throughout. 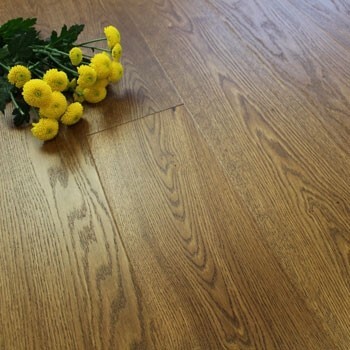 They are very different looking wooden floors and would suit very different environments. It is also important to remember that wood is a natural material so each plank will have natural colour variations which add to the character and charm of wood flooring. The species of wood should also be considered when thinking about how hard wearing you would like your wooden floor. 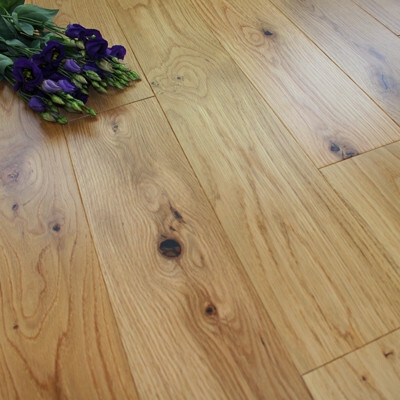 Although wood flooring is made from ‘hardwood’, there are some species which are harder and some which are softer. 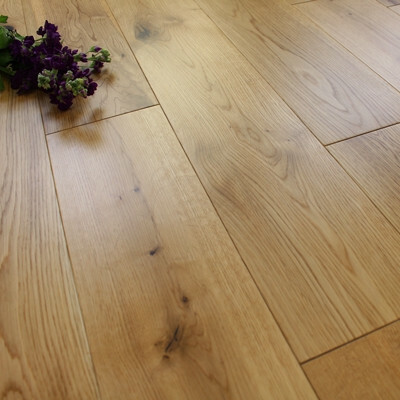 Oak is relatively hard-wearing and durable, which is one of the reasons why it is such a popular choice for wood flooring. In contrast, Walnut is comparatively softer and can dent and scratch quite easily if not looked after properly. The hardness of wood flooring is assessed using a scientific test called the Janka Hardness Scale. It tests each species of wood to determine how hard they are compared to others. To find out more about how the test is carried out and what the results are, please read the following: What is the Janka Hardness Scale for wooden flooring? What different styles or flooring are available? There are different plank types and surface finishes of wood flooring that will create different styles and effects. The most popular type of wood flooring is a single plank, which is sometimes known as 1 strip, wood flooring. 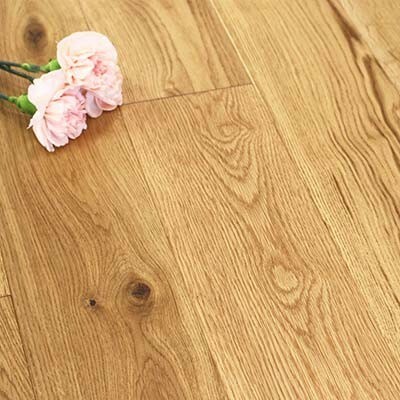 The planks’ widths and lengths can vary depending on which particular type of flooring you choose, but the principle is the same; the single planks are laid to create the traditional wood flooring effect. 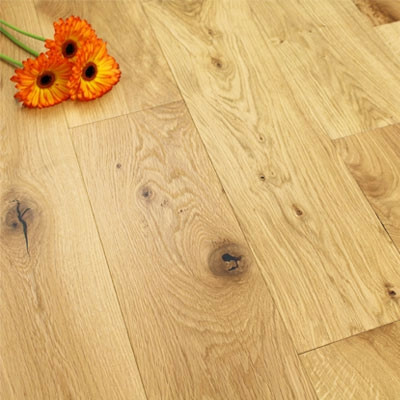 Alternatively, engineered wood flooring can be found with a 3 strip plank, which makes installation quicker and easier. The last option is parquet block flooring, which is small blocks of flooring in a uniform size that allows you to create geometric patterns such as herringbone or basket weave. 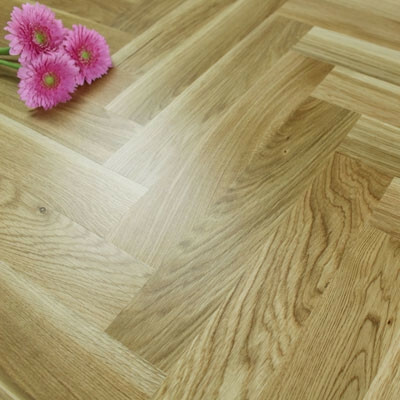 To find out more about parquet block flooring see our article: What is parquet block flooring? Choosing the correct surface finish is also a very important factor. The two main options are a pre-finished wood floor or an unfinished wood floor. Pre-finished means that the wood flooring has already has protective coats of oil or lacquer added during the manufacture stage. It could also be stained which alters the colour of the surface slightly, or it may have had distress marks or been brushed to give texture or an aged appearance. There are a huge range of options with a pre-finished wooden floor and the beauty is that it is ready to use as soon as the installation work is complete. Alternatively, an unfinished wooden floor means that you would install the raw wood, and then add colour stains and protect it with oils or lacquer once it has been installed. This can create a truly unique floor and can be a great choice if you want to match the style of your flooring to an existing décor or theme of room. 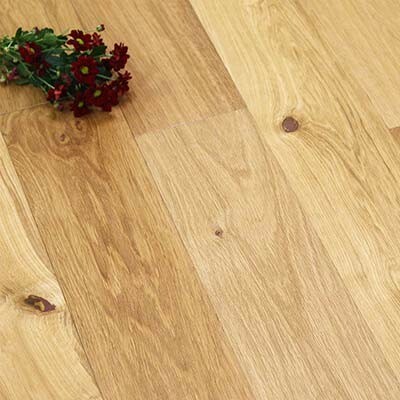 Can wood flooring be used with underfloor heating? 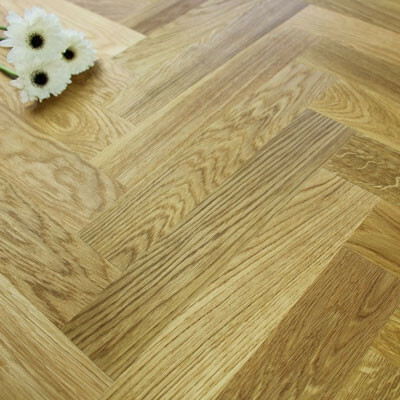 Only engineered wood flooring can be used with underfloor heating systems. Due to the way that it has been designed and constructed, it can cope with the constant changes in temperature and humidity that are inevitable with underfloor heating. The base layers of the engineered wood flooring give the planks more dimensional stability than solid wood flooring and allow them to naturally expand and contact at the correct rate with the fluctuations in heat. 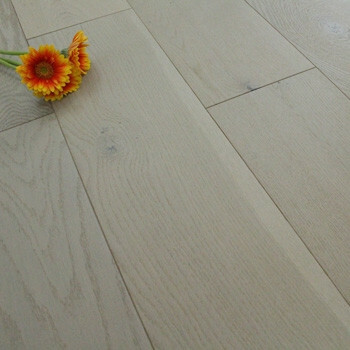 For more information, please read the following article: Wood flooring and underfloor heating. How do I install wood flooring in my home? Installing your wood flooring depends upon a number of different factors: whether you have solid or engineered wood flooring, what fitting system of flooring you have and what subfloor you have. Wood flooring is available with either a tongue and groove fitting profile or a click fitting system. Tongue and groove is the more traditional fitting method and most solid wood floors still only come with that option. The tongues and grooves of each plank of flooring are glued together to create a tight and secure fit. The alternative is the click fitting system which is becoming more and more popular as it is easy to use and cuts down the installation time. If you have solid wood flooring it will need to be fixed directly down to the subfloor with either glue or nails. 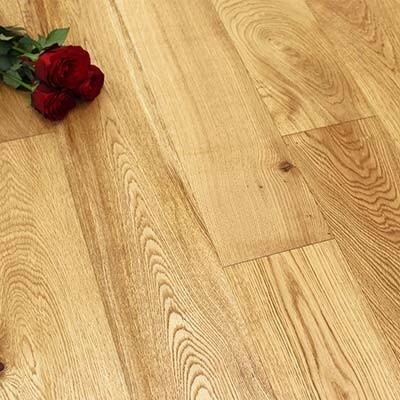 An engineered wood flooring can be floated over an underlay or fixed down. Before starting any installation, you will need to clean and prepare your subfloor and allow your wood flooring to acclimatise to its surroundings. For more information about installing a wooden floor, have a look at our Wood Floor Installation Guide. It is always best to seek the advice of a professional and technically trainer floor fitter before staring any installation work. Which rooms can I install wood flooring in? Wood flooring can be installed in almost any room in your house. They are hardwearing, hygienic and great for children and pets. 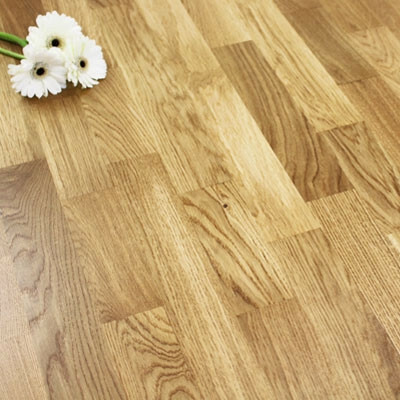 Solid wood and engineered wood can be used in living spaces, bedrooms and hallways but if you have a room with fluctuating temperature, humidity or moisture such as kitchens, conservatories or rooms with a lot of glazing, then you should use engineered wood flooring. The only rooms that we would not recommend you to use wood flooring in are areas with excessive water like bathrooms and utility rooms. If any amount of water is left to soak into your wood it can cause the flooring to warp, swell and discolour. How do I look after my wood flooring? Looking after any type of wood flooring is easy. The first thing to think about is how to protect your wood from damage. There are simple steps that you can take to avoid unwanted scratches and dents. Always remember to remove dirty, wet, sharp or outdoor footwear before walking on your floor. Never drag heavy or sharp objects (such as furniture or toys) over your wood flooring and if you can, use anti-scratch felt protector pads on the bottom of furniture. When it comes to cleaning your hardwood floor you should always use cleaning products designed for wooden floors as they are gentle yet effective. Try to sweep every day to remove dust and dirt from the surface of the floor. Then clean at least once a week (or as often as needed) with a microfibre mop and PH neutral wooden floor cleaning solution. Never use a steam mop, wet mop, furniture polish or any acidic or abrasive cleaning products. Read our Wood Floor Maintenance and Care Guide for further tips and advice.